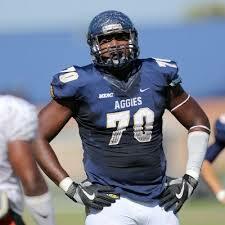 Brandon aka Big Stuff Parker and A&T got off to a fast start this season and never looked back. The Aggie offenese piled up 458 yards of total offense in the opening season 45-3 win over Gardner Webb. 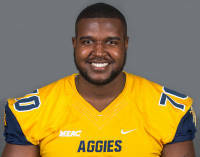 The 6’7″, 309 pound experienced Left Tackle also helped the A&T offense ring up 490 total yards the following week in the 56-0 win over Mars Hill. So in just the first two games of the season with “Big Stuff ” providing the power needed at the pivotal Left Tackle Position. The Three time SBN All-American has been a major force over the years in coach Rod Broadway’s Aggie offense. The A&T offensive juggernaut did not stop there ; two weeks later in the win over Morgan State the blue and gold racked up a season high of 514 yards of total offense and get this 345 of those yards were on the ground. 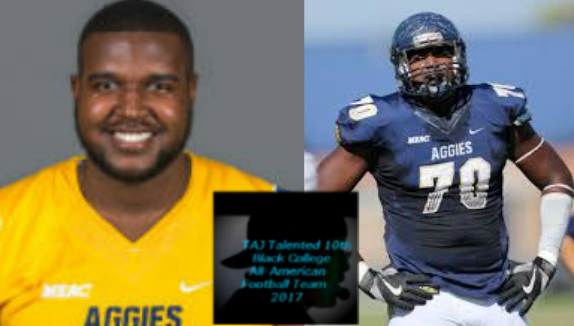 This season the A&T offensive line which provided the protection for the passing game and opened holes for the running backs helped power A&T to an average of 429.5 yards of Total Offense per game. What is even more impressive is that the Aggies were only held under 400 yards four times in 12 games this season. By the way, in the National Championship game against the touted defense of Grambling State ,Coach Broadways offense with Parker protecting the QB racked up a total of 397 yards and controlled the ball for a whopping 35 minutes in route to a 21-14 victory and the Black College National Championship.